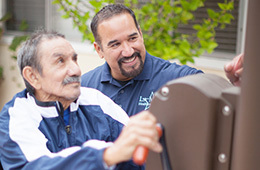 We want your stay here at La Mesa Healthcare Center to be an enjoyable one. We have created a warm and comfortable environment for our residents, patients, staff, and visitors. From spacious and sunny patio areas to cozy lounges, we strive to make our facility therapeutic and enjoyable. Thank you for entrusting us to care for you or your loved one.